Fully bespoke, it can be configured entirely to your specifications – from a single shelf for wall-mounting to an entire room’s worth of storage. Thanks to the naturally antibacterial properties of this superior-quality steel, it is highly suited to any environment in which hygiene and bacteria control are paramount: from healthcare institutions and veterinary surgeries to food-preparation sites and laboratories. Freestanding units can be supplied with height-adjustable legs if required. We can even fit locking castors, for areas where the unit might need to be moved. Shelves are supplied for easy fitting in their permanent position by the customer. Where variable shelving is required, we can supply a multi-tier unit, whereby shelves can be attached to different positions on rear bars. Robust, durable and ultra-hygienic: our 316-grade stainless-steel shelving is the perfect choice for a laboratory environment. From the easy-clean surface to the supreme strength of the metal, our shelves are designed to complement all lab applications. What’s more, because the shelving is fully bespoke, the options are almost limitless. small upstands can be added, to contain shelved items. For truly versatile storage, consider adding cupboards and drawers to shelving units. We are experts in supplying to the laboratory sector. Take a look at our range of laboratory-specified worktops, fume cupboard liners, hand-wash basins, sinks and shower trays, among others. Get in touch today, to find out how we can fabricate the items you need for your project. Super-durable and supremely hygienic: stainless-steel shelves from DSM are the best choice for a clinic, practice, hospital or care home. The naturally antibacterial properties of the metal, combined with the wipe-clean surface and lack of dust-creating materials (such as from wood products, like MDF) make it easy to maintain the high-hygiene environment so essential in a healthcare environment. Our steel shelves are fully bespoke: they can be fabricated to your exact specifications. This means you can acquire shelving that fits the application and situation exactly. Whether you need individual shelves for affixing to the wall, or ranks of open storage to line a room, we can supply the items you require. standard feet or locking castors, for mobility. Our stainless-steel items for the healthcare sector are widely used in hospitals and other healthcare establishments. Contact us today, to discuss our range of products, which includes shower trays, worktops, tables, vanity sinks, slop hoppers and sluice sinks. Stainless-steel shelves from DSM will last for decades, making them the cost-effective choice for your educational establishment. shelves can have upstands, to retain items. We can also incorporate integral cupboards and drawers, if needed. We offer a varied range of other items for the educational arena, including cupboards, worktops, washroom facilities, sinks and hand-wash basins. Contact us today, to discuss the requirements for your institution or project. DSM are a chosen supplier to the catering industry, thanks to the high quality of our workmanship and materials, and our strict adherence to deadlines. Our stainless-steel shelving units are made from superior-quality, 304-food-grade steel, and are so rigid and robust, they will last for decades, making them the obvious choice for your commercial kitchen. standard feet or locking castors for mobility. Contact us today, to discuss your shelving needs – and take a look at our wide range of other catering products, from cupboards, worktops and trolleys to hand-wash basins, catering sinks and splashbacks. 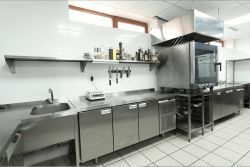 We also provide entire kitchens for the commercial catering arena. Our stainless-steel shelves are industrial-strength: they will last for decades, even in the most demanding of washroom environments. The naturally antibacterial and rust-resistant surface is also almost impervious to impact. Whether you require individual shelves for mounting on the wall, or a range of freestanding units, our bespoke service allows us to fabricate each piece to your specifications. Choose the height, width and depth of shelving you require; choose either standard feet or locking castors, for mobility; opt for standard shelves or choose rounded corners, as a safety feature; add upstands to shelves, if items need to be contained. Our washroom products don’t stop at shelving: we also offer lockable cupboards, plus vanity tops, urinals, hand-wash basins, shower trays and a wide range of sinks. Contact us today, to discuss your requirements. The height of contemporary styling, our stainless-steel shelving units combine functionality with aesthetics. Perfect for a modern interior, where gleaming surfaces need to be complemented by equally sleek storage, our shelves are made from superior-quality, food-grade metal, making them suitable for any room in your home. Our shelves are also fully bespoke: whether you want an entire wall of steel shelving for a kitchen or utility room, a single freestanding unit, or individual shelves for wall-mounting, we can fabricate the pieces you require. We can replace standard feet with locking castors, for a wheeled unit; fabricate shelves with curved edges; add small upstands to retain cookery books; or add an end panel to the unit, for a neat finish. We love a challenge: if you have a specific vision for your shelving, get in touch: we will do our best to supply the exact item you desire. We can also fabricate entire kitchens, from cupboards and worktops to sinks and hand-wash basins. As with all of our stainless-steel products for the home, our shelves are supplied with a twenty-five-year guarantee*, for your peace of mind. A busy veterinary surgery needs practical storage that will stand the test of time. Stainless-steel shelving from DSM is tough, impact-resistant, and will last for decades. It is also supremely hygienic: the metal’s inbuilt antibacterial properties combine with an easy-clean surface, to make it ideal for a veterinary clinic, where hygiene is paramount. standard shelves – or add upstands, to retain contents. We can also fabricate any other option, to your specifications, whether you are looking for built-in cupboards and drawers, or have a requirement specific to your practice. We offer a wide range of other products suitable for use in veterinary surgeries, including worktops, trolleys, tables and shower trays. Contact us today, to discuss your needs.